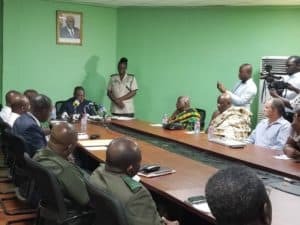 The Ghana Forestry Commission, Form Ghana Ltd., Form International, the Berekum Traditional Council and the Berekum Municipal Assembly have today signed an MoU to undertake landscape restoration in and around the heavily degraded Tain II Forest Reserve in Ghana’s Brong Ahafo Region. The signing event took place at the Head Office of the Forestry Commission in Accra. Enhancing biodiversity and nature values for present and future generations. Initially, interventions will be piloted on an area of approximately 2,000 ha, with the ultimate aim of restoring 100,000 hectares in the Tain II Forest. Partnerships for Forests is supporting the MoU as part of the Integrated Sustainable Forests Landscape Management project.